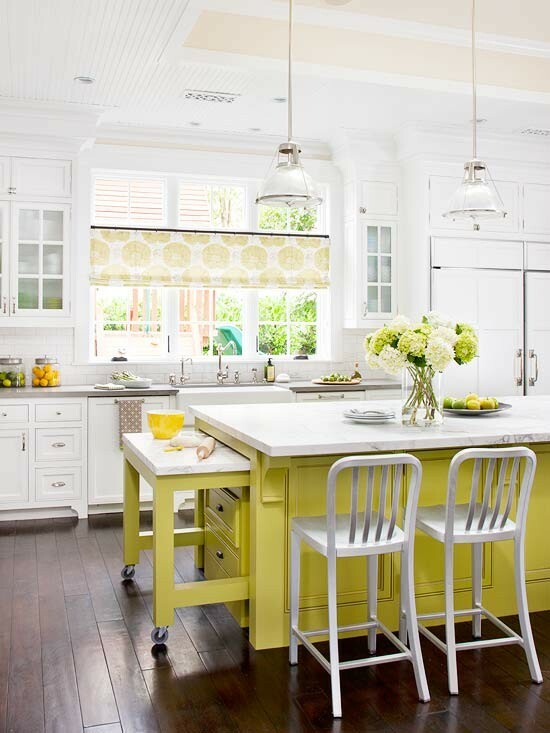 Many people believe the only color for the kitchen is white. They love the clean, fresh cottage-ey feel and the timeless, classic look--I'm one of those people! Now I know you may be thinking--that house is brand new and so are those cabinets and if this project goes south she's going to regret it big time...well I feel the same way! But I'm willing to take the risk. I've also browsed a few blogs that I follow like House*Tweaking, Young House Love and Centsational Girl just to name a few [believe me I have checked them all out] and I am confident that with my husband's help I can definitely pull it off! My only concern: I have black appliances! I prefer stainless steel appliances, but the black appliances came with the house. I think stainless steel just looks nicer in a white kitchen or any kitchen for the matter, but the black will have to do for now, or until I can convenience my frugal husband to let me ditch my new'ish black appliances for some stainless ones. Should the cabinets stay or should they go white? I love white (or off-white, really) cabinets, and I plan on doing to same thing to mine. But those are some nice new cabinets, and I"d be scared. Mine are ugly (honey oak, and not those nice 42 inchers), so if I mess them up I won't feel so bad. Good luck! I've been messing around lately with Caromal Colours paint, and supposedly it's great for kitchen cabinets. Check it out. We plan on doing white or off white with some antique glazing. I haven't heard of that type of paint, but I will have to check it out for sure! White may look boring for others, but it brings out a “simple yet elegant” image for kitchen cabinets. 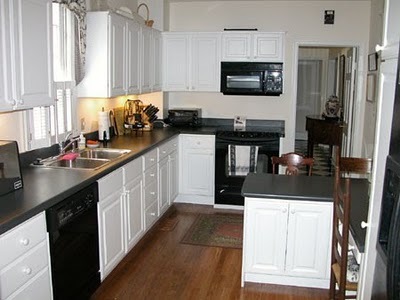 You know what, remodeling kitchen cabinets is actually one of the most cost-effective and visible kitchen improvements. With those white cabinet doors, you’re adding value to your home, Tyesha! My husband and I were just discussing this last night. I keep going back and forth with whether it's something I want to do, especially since I don't have stainless steel appliances. But we will see...here's hoping for a good outcome! Carl has a point. I have tried a lot of colors for my kitchen in the past few years and it always ended up looking great with all my stainless steel appliances. You should try to be imaginative and don’t be afraid to mix and match colors. What did you use to hang the kids artwork? Is it ikea? Yes, it is from Ikea (DIGNITET) curtain rod. Lisa it's funny that you ask. I have done anything....yet! I'm still trying to decide. We are also thinking about purchasing our second home and renting our current one and I don't think white would be a good color for renters. Hopefully there will be an update soon! The custom cabinets are made according to the specifications you give or according to the kitchen designs. They are normally made in high quality finishes and materials and they meet your needs. It seriously looks like it came from a magazine! I love all the little details too! I absolutely LOVE the look of your kitchen. It's so gorgeous. You should be proud of yourself! !